DZ's Adventures: To Harness, or Not To Harness? BSL - What is it? To Harness, or Not To Harness? Throughout the ages harnesses have been used on many different animals for many different reasons, the main reason though was to equally distribute weight for maximum efficiency and for the health of the animal. Most dogs tend to pull in the beginning stages of leash training. If you put a harness on a dog that already likes to pull you are giving them more reason and ability to do so. Why do people use harnesses? Some people feel that it is kinder than choking a dog out. A dog that is pulling too hard can damage their trachea and neck muscles. Another argument is that it evenly distributes the pressure across the dogs body. 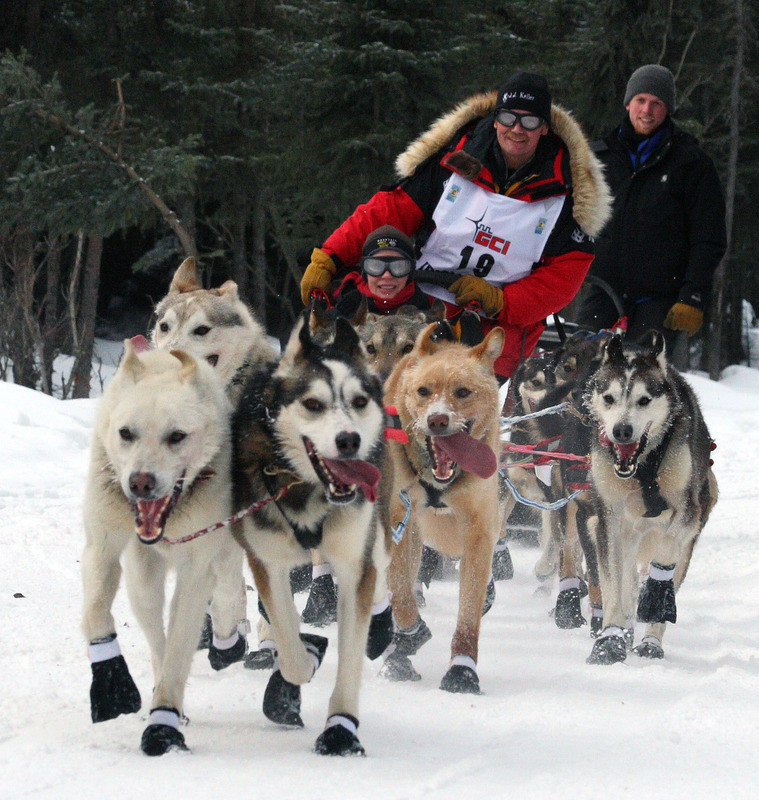 Some harnesses allow for two points of connection - for this particular style they use a back and forth technique to teach the dog not to pull. More comfortable for the dog. If your dog isn't pulling then comfort isn't an issue and a collar will do just fine. Better communication between dog and handler. This I really take issue with...your dog should be paying attention to you when you are walking unless they are being given free time. Walking is a great way to bond with your dog, our dogs understand that the leash and a walk is business and they are working. Unless we give the signal, "Ok" then they do not get to sniff at whatever they desire and they do not get to choose where we go. Their job is to pay attention to the handler be that myself, my hubby, or any person/child holding the leash. They should always walk next to and not in front of the handler. Standing perfectly next to daddy. This is a good loose leash walk. See the slack in the leash? See the slack? It's actually draped on Dante's back their was soo much slack. 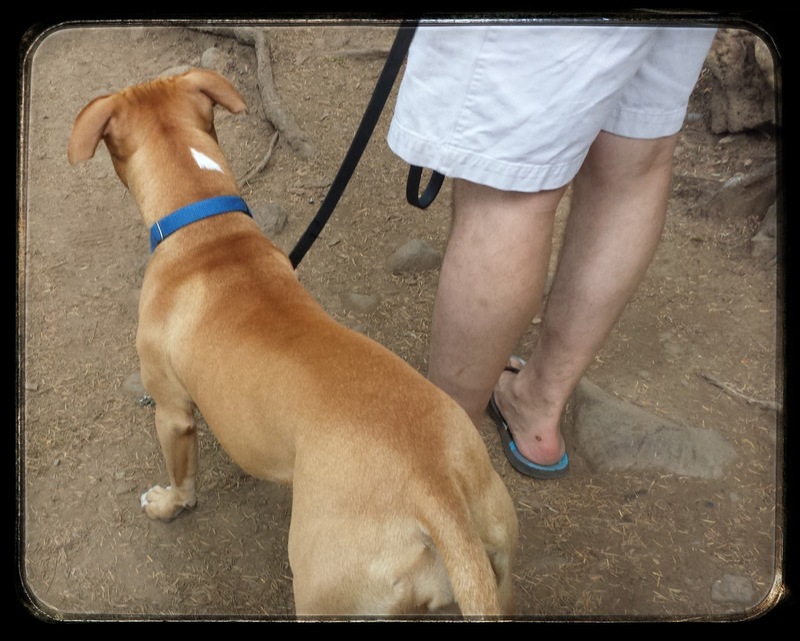 And this was a very dog exciting hike! I think the biggest reason people choose a harness as their training/walking tool is because they do not want to hurt their animal. However you can in a positive and not harmful manner teach your dog not to pull with patience, practice, and training. A walk with a leash doesn't have to be cruel or painful for your dog, their is no need for you to walk away feeling like a terrible person. Most people I have seen using a harness are not using one properly. They pick one up at their local pet store because it is in style, and they like the idea of not hurting their dog who pulls against its collar. They do not however put any thought into how to properly fit or use said harness, and they don't take the time to learn. The dog still pulls even when wearing a harness, and now they have more leverage to do so! On top of that, if the harness does not properly fit it can impede your dogs movement and cut into their skin. Now please don't misunderstand what i'm saying...with proper techniques and two leads a no-pull harness can teach your dog not to pull. Please seek professional help for fitting and learning to use a harness if that is your preferred method. And by professional I don't mean a store clerk. Their are many methods for leash training, what's important though is that your dog is under control and you are enjoying the walk too. It's also important to keep learning and not use tools as a crutch but rather a stepping stone. If a harness is your preferred first step that's fine. But keep in mind it should be a stepping stone not an end. It's safer for everyone involved that your dog not pull when on the leash. If your dog is pulling and becomes extremely excited or is a large/strong breed you can lose the leash, worst case scenario they attack another animal, bite a person, or are hit by a car in their moment of excitement. This is why control is soo vital. 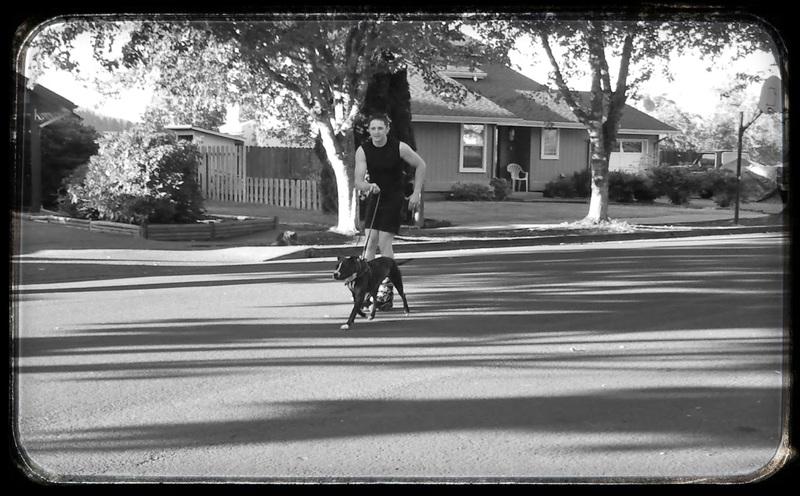 Anyone can walk our dogs, but it takes upkeep and constant practice. Notice he is not pulling. When we first got Dante he came with a slip chain collar and he pulled really bad, so bad in fact that he had sores on his neck from the chain pinching his skin. Dante's Story Here. We switched him to a Martingale Collar for a few reasons; Martingale collars do not choke your dog or cut off their breathing the way a slip (choke collar) does. I can put two fingers under Dante's Martingale collar when it is at it's tightest point, this allows plenty of comfort in its fit while not allowing your dogs head to slip out. They were originally designed for breeds with larger heads and small necks like greyhounds - the goal is just to prevent the collar from slipping off. Hopefully you can see from this picture how the collar works. 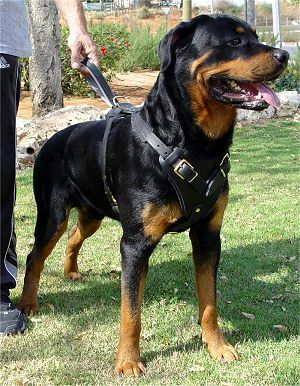 The chain allows the collar to be really loose but does not choke the dog should he pull. These collars are also made out of cloth if you don't prefer a chain. We like Martingale collars, they are quick and easy to take on and off and I like the idea that their heads can't pop out in a crisis. After Dante learned to walk nicely we then introduced a "joring" harness specifically so that he could comfortable learn to urban jore - pull my husband in this case on roller blades. Read more about that HERE. I'll be covering joring in more detail in another post. We used to use corrective, "Positive Punishment" training techniques with Dante. We quickly learned that not only did it not entirely work, but it also created anxiety in him during our walks. 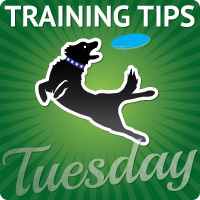 Training should be a fun and bonding experience for everyone involved including your pup! If this is not the case you are clearly doing it wrong. More on Positive training techniques HERE. Positive Training techniques help to create a stronger bond with your dog, it improves your overall relationship and contributes to a more trustworthy confident dog who desires to please and work with you. From a proper "heel" position you can then work on off-leash training which creates a stronger bond between yourself and the dog and makes them more reliable in emergency situations, if your leash breaks, or lets say you don't have enough time to find/put your harness on your dog. The whole point is that your dog is under control and not pulling. The end goal of any training device is the same; a comfortable and enjoyable bonding walk between you and your dog. Dante and Ziva practicing, "wait". The harness style that I like for not pulling is the front clip harness. Unlike the back clip harness it's less likely to enhance that pulling sensation. I've used both a front clip and back clip harness and can notable notice the difference in my freight train puller (Kronos) and in the semi-puller (Terra). But I totally agree that it should not be used as a crutch is teaching proper leash walking skills. Kronos pulls so hard that I worry about his neck and throat, so I like to occasionally use the harness instead of a regular collar until he learns how to properly walk on leash (and then simple collars are much easier to put on and off). Great post! Joring looks fun-can't wait to read more about that! 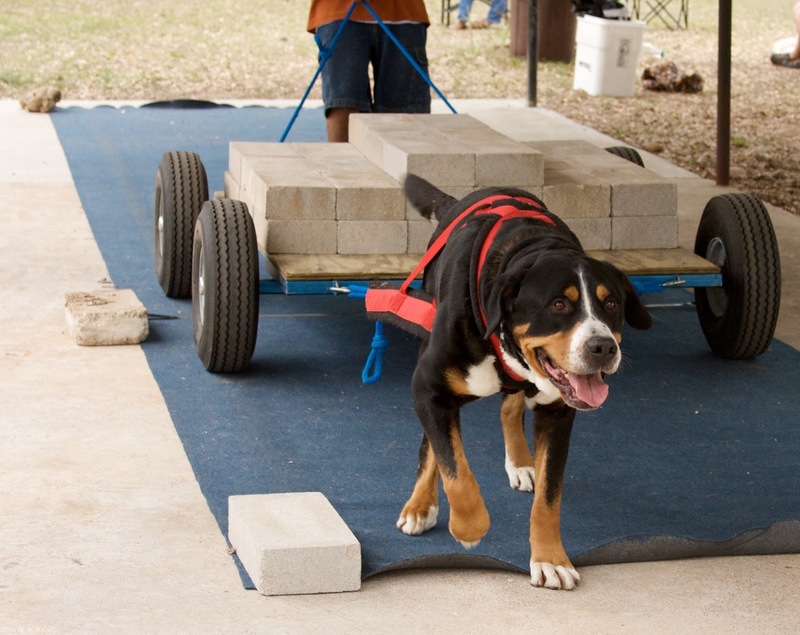 The Carting and Weightpulling also look fun-I'd like to try those out and see how Kronos likes those because he is such a strong puller! Thanks for the comment! I would love to get Dante into some sort of K9 sport, joring is as close as we have gotten. Their aren't many teams near us and we're pretty busy. The problem with front clip harnesses comes when people allow or ask their dogs to run in those harnesses, or even just walk a lot in them. They severely restrict front leg movement, so cause a lot of problems if the dog is walking in them a lot, running in them at all, or doing other stuff like jumping. I hate, hate, hate when I see people using front clip harnesses on dogs while the dog is being active. 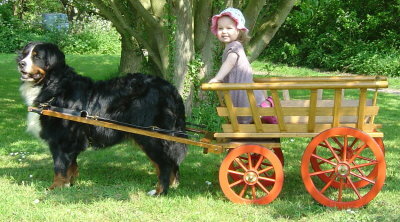 Want to use it to walk your dog to the park? Great. But take the damn harness off before you start to play fetch! I enjoy your posts and how informative they are! When we were new to the whole dog thing we first got a halter (like a harness) that was back a back clip only. In order to walk Barry when we first got him I needed something to help with his pulling or there would have been no walks. At the time I didn't have the strength to hold him back (my husband did, though). He was a wild animal at first and he pulled like, well, a strong, young, and untrained pitbull. After we got recommendations and did a little research we went with the Freedom Harness which I love. It has a front clip and back clip (one leash with two ends with a handle in the center). Our walks with Barry are mostly all loose leash now (unless we see a squirrel and he's done). I may look into the Martingale style. I'd never realized they couldn't slip off. To me, they looked like they did and never looked into further. Every collar we've gotten for Barry (including his leather buckle collar) has been able to be slipped off his big fat head somehow or another so the thought of anything collar-like scared me. The only time I am unable to fully control Barry is when there is a squirrel running around in sight. I have the leash clipped to the both the front and back and drag him away while he whines and cries and simply doesn't hear me. He is the reason I need to work out almost every single day. So if we do encounter a squirrel I have the strength to pull him away and switch directions. Luckily, most of the squirrels stay in a few 'hot spots' that I avoid. I got off topic, but you get the point. We are still working with Barry but I have a feeling the squirrel issue is going to take some time and tons of repetition. Maybe the Martingale style will be more appropriate with Barry now that I know more about it. Glad to hear your walks with Barry are getting easier, I think you'll like the Martingale style of collars as you keep advancing in your walks. I must confess I'm mainly concerned that people have control over their dogs when they have them out leash or harness. If they are being pulled or not is their problem. Mine is that the dogs aren't aggressively leaping and unable to be pulled back when approaching my dogs. We started with harnesses and moved to collars and have never had an issue. We kept the harnesses for car travel. Sorry that should say collar or harness not leash or harness. You obviously need the leash. I use a head halti and martingale for him on our walks. Halti for the head control, and collar in case I ever need to grab him in an emergency. I don't like using prong collars, but I do use it in the winter time if it's icy outside for safety. He'll walk well with me, but as mentioned above, little animals love to pop out randomly and that can be dangerous for the both of us. I am actually purchasing a weight pull harness sometime this month for him from http://www.mightyharness.com/ I've seen a couple of videos of Dogo's pulling tires, and our walking trail would be great do that every now and then for an outlet for him. @April Nichols Thanks for that website! We did a lot of research when we got Dante his Joring harness (its designed specifically for the sport) he loves it! And gets really excited when he sees it or the roller blades come out. I'm a big fan of martingales! I agree that so many harnesses do encourage pulling -- after all, like you say, that's what they were originally designed for! I wish more folks knew about martingales. When I have my temporary shops at events, so many folks think they're choke collars - which drives me nuts because I hate choke collars and they're quite the opposite! I have to explain quite a bit, but at least they can discover a nice alternative in the end. I myself was introduced to them when my first dog popped his collar a lot because his head was so small with a wide neck (kind of like a sighthound, although he didn't otherwise look anything like one). So useful for safety, in addition to walking. @Jen deHaan So true! Everyone thinks they're choke collars, we don't like using pain to teach our dogs (and with their short skin it pinches!) so we avoid tools like those and prong collars. Nice to hear from another martingale fan! Barks & Howls are always welcome!! Dogs, positive dog training methods, inspiring healthy animal relations, and busting myths about bully breeds are things that we are passionate about. As a family we foster, train, and play flyball! We would like to encourage others to really research breeds before getting a dog, a dog it a lifetime commitment of 10+ years and should not be done in the "spur of the moment". We love our furbabies! 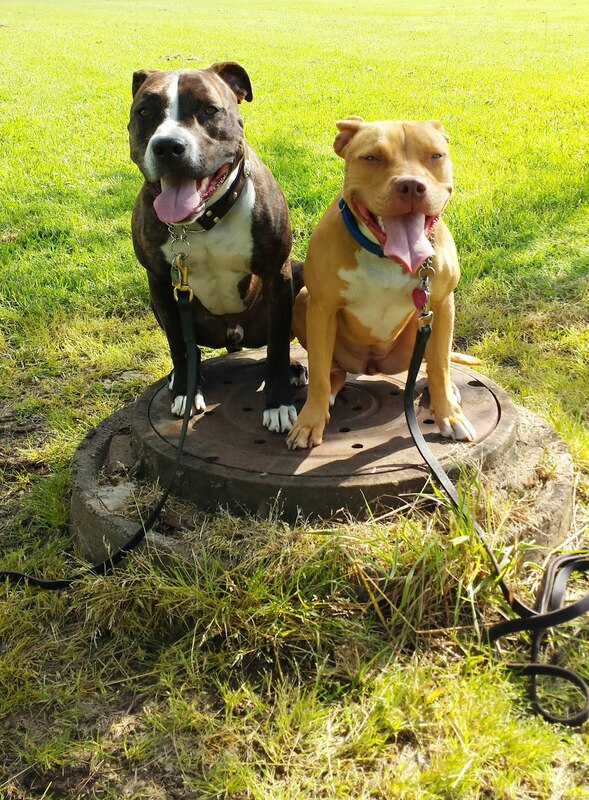 Dante & Ziva are both rescues working hard to change breed stereotypes and melt hearts. Unauthorized use and/or duplication of this material without express and written permission from this blog's author and/or owner is strictly prohibited. Excerpts and links may be used, provided that full and clear credit is given to DzDogs.com with appropriate and specific direction (hyperlink) to the original content. Happy Easter or Chag Sameach! A Pressie From My Love! Whatcha Looking For? Search Here! A Picture Worth a 1000 Words. Exercised Dog's are Happy Dogs! We Were Featured By the Dodo! Click to read more! Follow Dz Dog's board Dogs on Pinterest. Theme images by Cimmerian. Powered by Blogger.